IONTAS Ltd., a leader in the discovery and optimization of fully human antibodies, announced its Founder and Chief Executive Officer, John McCafferty was invited to attend the Nobel Prize Award Ceremony in recognition of his pivotal contribution to the development of antibody phage display technology. The event, held in Stockholm, Sweden on 10th December, celebrated the 2018 Nobel Laureates and the success of phage display technology in modern drug discovery and development, which the Royal Swedish Academy of Sciences recognized in this year’s Chemistry Prize. 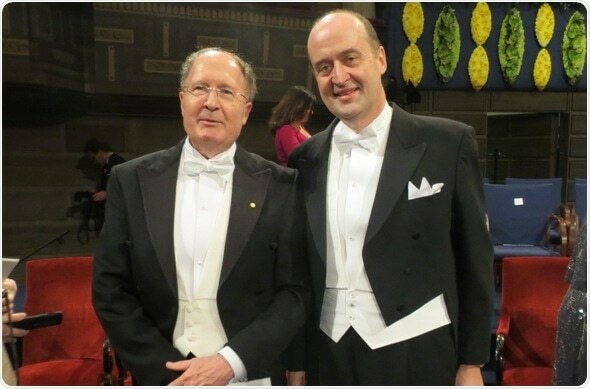 Sir Gregory Winter (MRC Laboratory of Molecular Biology, Cambridge, UK) and George Smith (University of Missouri, Columbia, USA) jointly received one half of the Nobel Prize in Chemistry 2018 “for the phage display of peptides and antibodies”. Frances Arnold (California Institute of Technology, Pasadena, USA) was awarded the other half “for the directed evolution of enzymes”. Smith published his breakthrough paper on display of peptides on filamentous bacteriophage in 1985. Inspired by this, Winter and McCafferty then applied the approach to antibody display, with the aim of producing new pharmaceuticals. While working in Winter’s group McCafferty became the first to demonstrate the display of functional antibodies on the surface of phage (McCafferty et al., 19901). This landmark achievement, cited by the Nobel committee, made it possible to create “libraries” of phage particles containing billions of different human antibody genes from which antibodies to any target could be easily isolated. The technology they developed has proved to be robust and has unleashed a revolution in antibody discovery leading to 11 approved medicines to date with another 41 candidates in clinical trials. In 1989 Winter, McCafferty and David Chiswell founded Cambridge Antibody Technology (CAT, now MedImmune) who used the technology to develop the human antibody that became Adalimumab (Humira®), currently the world’s highest selling drug. The technology has since been adopted by many biotech and pharmaceutical companies including AstraZeneca, GlaxoSmithKline, Roche, Genentech, Merck and Sanofi, for use in antibody discovery and development. I offer my congratulations to the winners of the 2018 Nobel Prize for Chemistry and am delighted to have been able to attend the ceremony at Greg Winter’s invitation. I feel proud that the Nobel committee have recognized the importance of our work. The widespread uptake of this technology has had a significant impact on biopharmaceutical pipelines and healthcare, and further development of novel platforms using these techniques will continue to drive antibody discovery forward." Following 12 years at CAT, McCafferty headed research groups at the Wellcome Trust Sanger Institute and University of Cambridge and in 2012, he founded IONTAS, a self-funded, profitable biotech company further developing the next generation of antibody discovery platforms. IONTAS has led the development of a novel technology allowing the construction of very large mammalian display libraries to permit the direct discovery of high-affinity antibodies with optimal biophysical properties. Iontas has also developed a novel bi-specific fusion molecule (KnotBody) to target ion channels, G-protein-coupled receptors and proteases. The pivotal work achieved by the team at CAT has revolutionized monoclonal antibody drug discovery, and led to major breakthroughs in biopharmaceuticals. John’s contributions to the platform and entrepreneurial success has continued through establishing IONTAS and positioning the company as a leader in the discovery and optimization of fully human antibodies. Our team continues to strive towards developing innovative medicines to benefit all patients through the development of novel technology platforms. These platforms facilitate rapid progression from drug discovery to manufacturing and enhance antibody drug discovery by, for example, generating antibodies against difficult targets such as ion channels." Dr John McCafferty will be presenting on “Display Technology; Past, Present and Future” at Antibody Engineering & Therapeutics in San Diego, USA on 13 December 2018 and attending the J.P. Morgan Healthcare Conference taking place in San Francisco, USA from 7–10 January 2019.